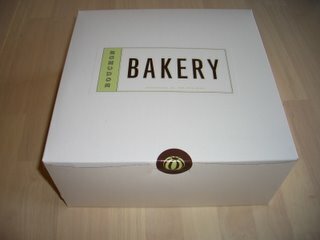 Note: I have revisited Bouchon Bakery. Bouchon Bakery is one of the many bijoux bakeries between my home and the school, albeit in the town of Yountville, not perched on the teeming asphalt of Highway 29. 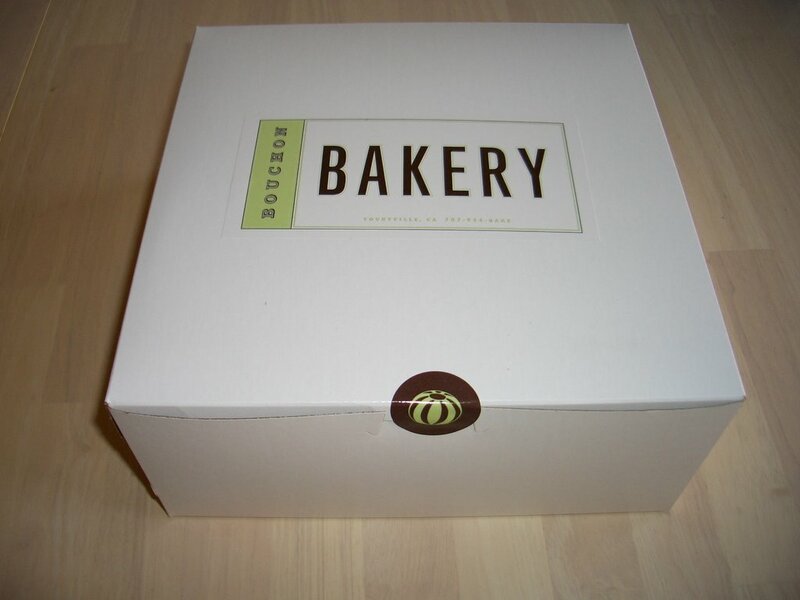 Bouchon Bakery was opened in 2003 by Thomas Keller, of The French Laundry and Bouchon, and is known for its wonderful breads and pastries. Despite the size of the building, the sales space is cozy and packed full of goodies. Another Bouchon Bakery is opening soon in NYC in the Time Warner Center, where Keller also has Per Se. 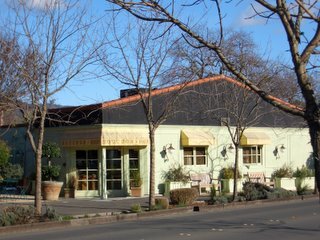 Keller, by the way, is a Napa icon. They probably sell posters of him.... somewhere. 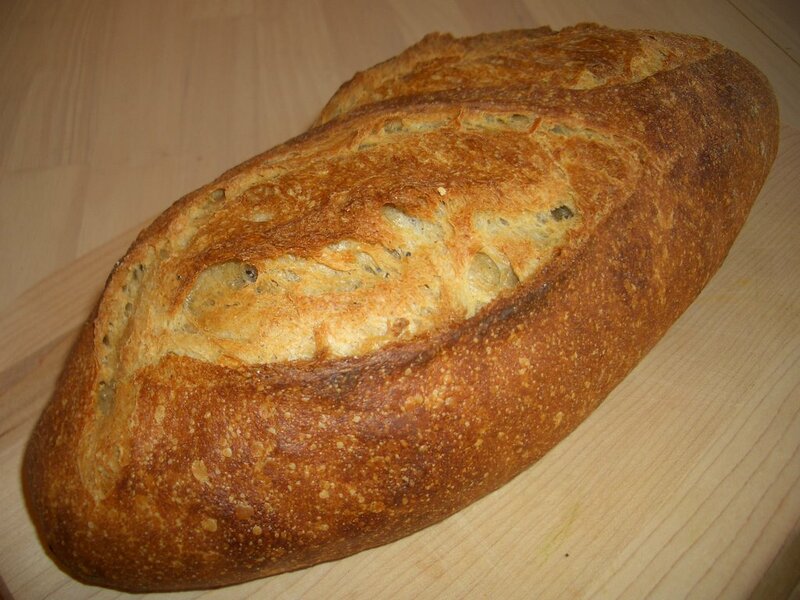 I started off with their Pain de Campagne. It was chewy and hearty, with excellent crust and crumb (which is the term for the inside matter, not the crumbs that fall off). As I read in one my books last night, the three colored crust, irregular gas cells, and the glossy sheen caused by the gelatinizing reactions of starch are indicators of quality bread. Then I got down to desserts. This is a small sampling of what they had. 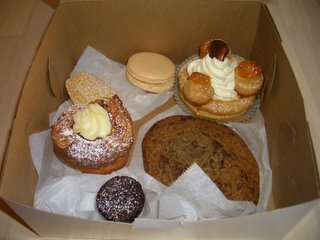 A madeleine, vanilla macaron, st honore pastry, chocolate chip cookie, bouchon, and cheese danish. The cookie was good--the chocolate is in very small pieces, so it has a uniform flavor. There are some sugar powers at work, too, giving the dough an almost caramelized flavor, and the outside inches have a bit of a caramelized top. I liked this unique added sweetness.. Usually a chocolate chip cookie with a high percentage of sugar spreads very thin and gets crispy, but this one was thick and chewy; maybe bread flour was used, which has higher protein and stays firmer. I thought I tasted hints of hazelnut and liquor in the chocolate, but that could have just been my taste buds gone wild. I try to be excited by madeleines, but they're too dry and bland for me. This one wasn't a revelation. Maybe their chocolate cherry brandy one is. The cheese danish was one of the best I've had. The cheese was a lemon flavored cream cheese-y concoction enrobed by a muscular danish dough. It's dense and makes you feel strong working your way through it. A "bouchon" was labelled as their signature item--a moist and dense brownie-like confection laced with chocolate chips. 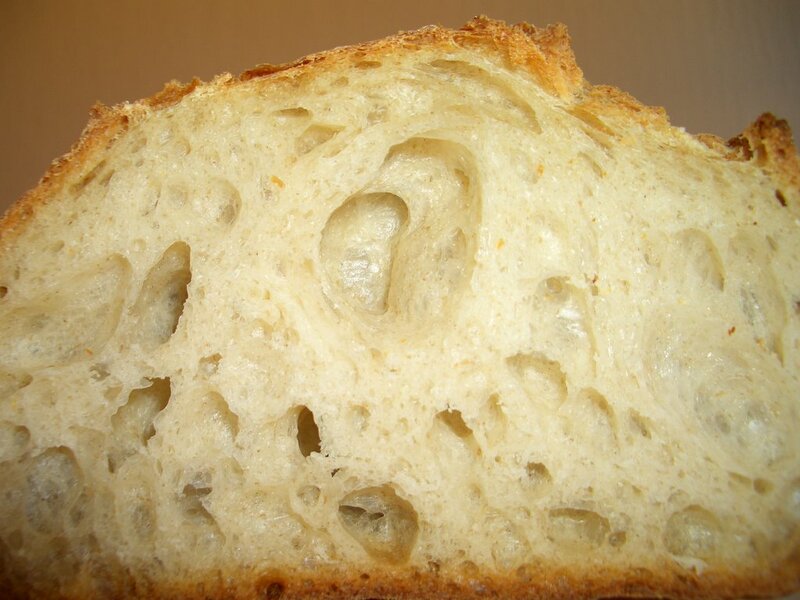 The outside had an ever so slight firm chewiness to it that wasn't quite a crust. Now, a bouchon is a certain type of French cafe.... so since this rather un-French and I can't locate a reference to a dessert named a bouchon on trusty Google, I'm going to guess that this is an original (let's all ignore Brownie Bites). 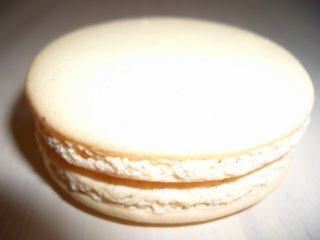 The St Honore was my favorite, largely thanks to this little flavor bomb. There are three of these around the tart -- three mini profiteroles filled with pastry cream and encrusted top and bottom by crunchy caramelized sugar. Think about biting into that for a second. Your teeth crackle through the caramelized sugar and into what seems like straight pastry cream... as your teeth lift up, the slightly chewy choux pastry asserts itself as mangled into this mass of hard sugar and soft cream.... it tastes like cream, vanilla, rich caramel, and pastry are all one, and it's expanding in your mouth. You want to savor it, but you also need to breathe. Before you know it, it's gone. Whenever possible, buy St Honore pastries. 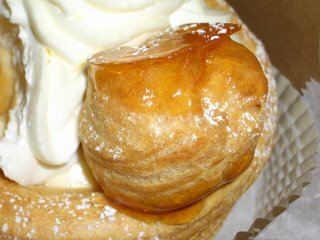 La Religieuse is a closely related pastry also made of choux pastry that has fondant icing instead of caramelized sugar. They're supposed to look like French nuns, hence the name; they have one small profiterole atop a larger one, so I guess they look a bit more austere but they taste very similar. I've had them in mocha, lavender, rose, chocolate, and vanilla. Whenever possible, buy them, too. .... but this one had glowing powers. 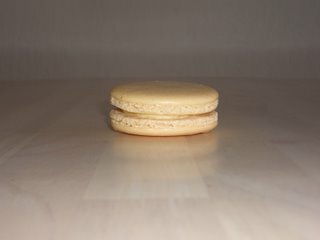 i really liked your bouchon bakery post. i go to western culinary and am looking into doing my externship there. thanx for the info! Cool! If I'd gone to law school in Portland, I'd probably be going to Western Culinary now -- as it worked out, CIA was just the closest one for me. I hope that you're enjoying it! 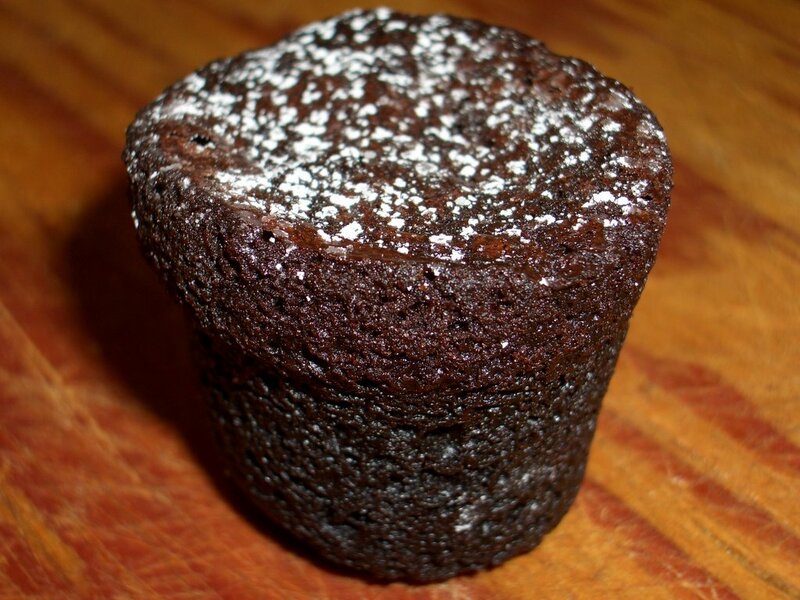 The dessert is probably named "bouchon" because it resembles a big cork. This is the meaning of the word in French. Certainly looks tasty!